SANTIAGO (Reuters) - South American leaders will meet in Chile this week in hopes of forming a new regional bloc to replace Unasur, which was launched by Venezuela's late socialist leader Hugo Chavez but has splintered over his country's crisis under his embattled successor, President Nicolas Maduro. Maduro was not among the leaders invited to meet in the Chilean capital Santiago on Friday to discuss forming a new regional political group called "Prosur." Heads of state from Argentina, Brazil, Colombia, Chile, Ecuador, Paraguay and Peru will join the summit, with Chile and Colombia looking to sign countries up to the new political bloc after criticism over Unasur's lack of action on the Venezuela. Some leaders have criticized the organizers for leaving out Maduro and instead inviting Venezuelan opposition leader Juan Guaido, recognized by many countries as the interim leader. Guaido has said he will send a representative. Bolivian President Evo Morales, a close ally of Maduro, and Uruguayan President Tabare Vazquez are not expected to attend. The Unasur bloc was established in 2004 at the behest of Chavez. It was modeled on the European Union at a time when center-left governments were at their strongest in South America. Politics on the continent have shifted toward conservative leaders such as Brazil's Jair Bolsonaro, Argentina's Mauricio Macri and Chile's President Sebastian Pinera. As Venezuela has descended into political and economic turmoil, Unasur members have been divided on how to respond. 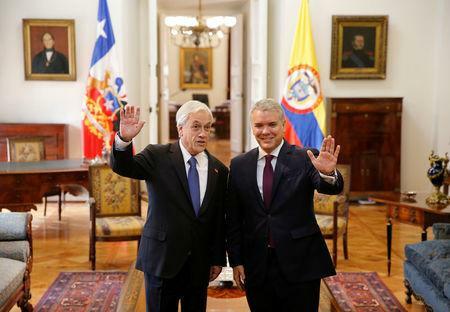 In 2017, Bolivia and Ecuador opted out of a joint statement in which other Unasur countries called for democratic order to be restored in Venezuela. Half the nations belonging to Unasur suspended their membership in April last year. A few months later, Colombian President Ivan Duque announced his country's withdrawal the bloc, calling it an accomplice to the "Venezuelan dictatorship". Ecuador withdrew this year. "Unasur failed due to excessive ideology and bureaucracy," Chile's Pinera said in a Tweet this week, claiming the new Prosur bloc would avoid these pitfalls without elaborating. Chile and Colombia have been the driving forces behind the bloc's formation. Jose Miguel Insulza, the former head of regional body the Organization of American States (OAS), rejected the creation of the new bloc on the grounds that it is "born divided", Chilean newspaper La Tercera reported. Former Brazilian Foreign Minister Celso Amorim told La Tercera that the bloc did not seek unity and its sole objective was to put an end to Unasur. An agreement or joint declaration is not expected to come out of the meeting, according to the most recent version of the press guide and schedule for the event.